"Blue Voyage" is the most authentic mode of travel of Turkey. It's the search of mankind for the traces of his existence in a sunset, struggle of a fish to escape from the hook, ruins of a church or a tower, bees drinking seawater. It's an exploration towards nature and naturalness in space dimensions, towards history and background of human being in time dimension. The gullet tourism, other than bareboat concept, is a travel and vacation type that is derived from Blue Voyage tradition and peculiar to Turkey, which can be considered fully Turkish style. 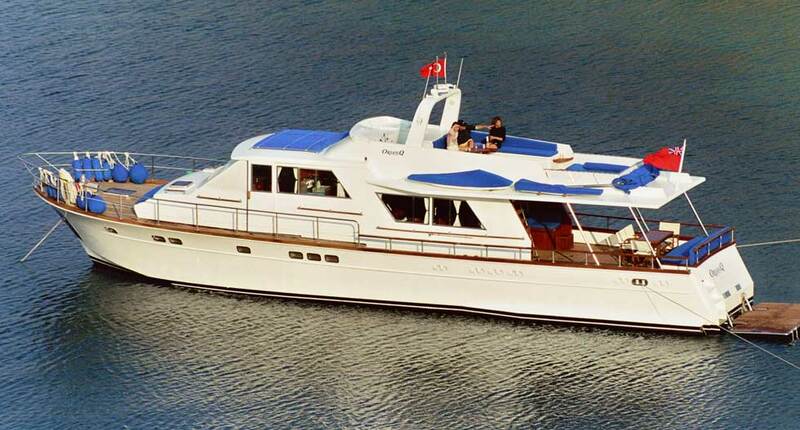 This is a type of yacht tourism made with the vessels having permanent crew or multi-property yachts, which became famous at the classical, ultra-luxury or international races and then adapted from classical, ultra-luxury or international races and then adapted to tourism or, in some exceptional cases, with yachts adapted from classical design basically. The Turkish gulleting is an implementation in which the last example becomes a rule. Almost 75-80 percent of the yacht fleet consist of traditional wooden or classical model vessels sailing on the waters of Aegean and Mediterranean for hundreds of years. The blue voyage has exercised an evolution in terms of boat building technologies by adaptation of traditional structures to tourism. The yacht tourism or matter of fact blue voyage, is a type of luxury pleasure and vacation with a certain cost. The yacht customer as defined by us comprises a profile that rents the vessel completely for himself and his dependents/friends for a certain period of time and tours in a manner as if he was the owner of the yacht. Spaciousness and comfort of the cabins or quality of the service is more important for this type of customer, rather than the number of beds and passenger capacity of the yacht. The crew members are in charge of for cooking, catering, and safety of the vessel and the passengers, thus keeping them happy and comfortable at all times. The crew, consisting of a captain, a cook and a seaman lives like a family with the passengers during the voyage and have all the necessary technical and practical knowledge about their chores.